As we age, we just don't Party like we used to. We used to go to a friend's house, and do the Super Bowl Up! Then our kids got older, and we realized it's a School Night. Then we realized we actually hate having to wear clothes outside the house past dark. Seriously, it's a Lot Of Love for someone that leads me to not be in my jammies at 8 pm. 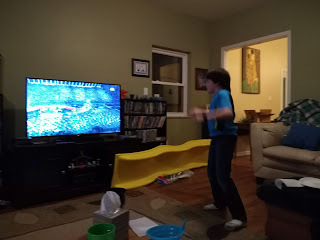 So, we've taken to watching the Super Bowl at home. We don't traditionally make a bunch of fancy food, we ordered pizza once, but it took like 3 hours to arrive. This year, I didn't think we cared much about the Super Bowl. It ended up being the Eagles against the Patriots. we ordered a Pizza Kit off a friend's son, with a build your own pizza, breadsticks, and cookie dough. Super Easy! I'd totally be doing that again. The only thing we missed most of the first quarter because the TV antenna was being super fritzy. But after a half an hour of Eric messing with the Plex channel he created, I gave up, and tried the NBCSports App. Boom, there it was. Now, every commercial break, it would fritz out on me for a second, so we only saw about half the cool commercials. But as it turns out, that was ok. 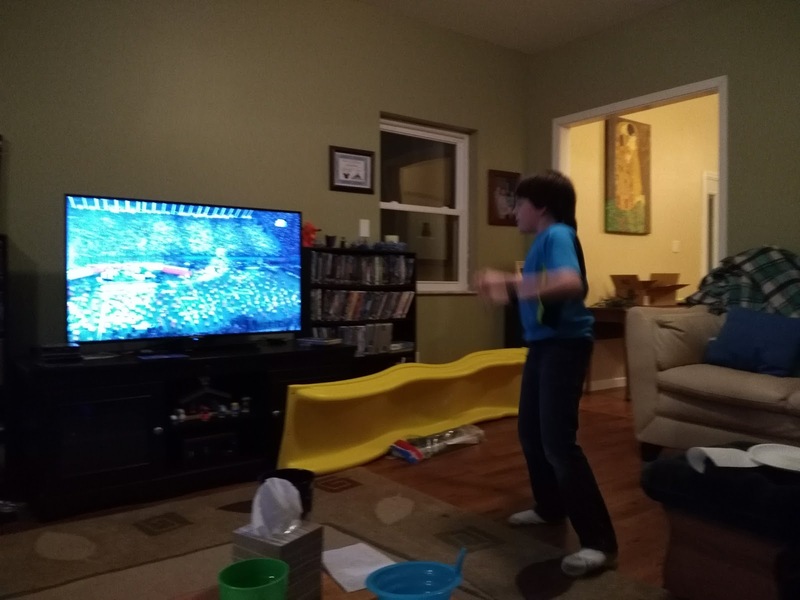 It turns out my Kids like football games. Way to go Opa. Sam instantly began rooting for the Eagles, because they wear Green. Of course. That wasn't surprising at all. I was rooting against Patriots. Chris began to root for them too. He asked me why we hate the Patriots. At first I just said, They Cheat. But then as the game progressed, they kept giving us reasons to dislike they way they play. All new reasons. By halftime, the boys were calling the Eagles, WE. That's fine, I can be an Eagles fan for a night. Usually I root for Colts first, Peyton second (or Eli since Peyton retired). Everybody else. Meh. But yes, I root against Patriots. They like to push the limits, and not really in a good way. How often when they play did you hear last night, "Well, that's not Technically Illegal"? I think that's a sign. They are like kids. Actually, a lot like kids. Tom Brady has Temper Tantrums, and Cries when he doesn't get his way either. Yes, a lot like the kids. Frankly, I was impressed by how the Eagles handled themselves at the game, and after. I love how they Praise God first. Chris had to join Justin Timberlake when he started dancing to "Can't Stop the Feeling". Jacob didn't make it to Halftime. 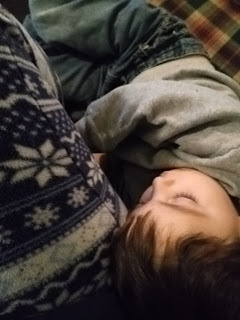 He felt a little warm to me, and was curling up, putting his hands under my legs, because I am the "Warmest". This morning he woke up with a Fever.